SUBHEAD: In a generation Kauaians may be driving around the island on gravel roads. Image above: Lowell Frederes stands along 113th Street in Omaha, Nebraska on August 10th. The city had ground-up the asphalt surface of the street saying it was beyond repair and replaced it with a gravel road. From original article. For miles and miles Omaha stretches on, one tidy, suburban-style neighborhood after another filled with modern low-slung houses set on spacious lawns with towering oaks and elms. It’s a model of comfortable mid-American living, with one unusual exception: thanks to a quirk in how Omaha developed, about 300 miles of streets in these nice neighborhoods are pitted with potholes almost big enough to swallow an SUV. The bad roads have been both an anomaly and a source of complaints for years. But recently, they’ve become the center of a mini-crisis after local officials began dispatching crews to tear up the asphalt in the neighborhoods and turn the streets back into dirt roads, much like what existed in the city’s frontier days. 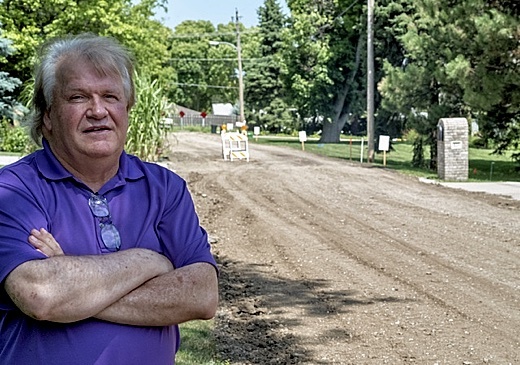 The sudden appearance of miles of dirt road in the midst of urban Omaha has prompted angry protests by residents and showcased a conflict over the public services homeowners should expect when a modern city outgrows some of its old real estate agreements. Nearly every U.S. city faces a backlog of needed roadwork as streets built decades ago wear out, but the situation is especially vexing in Omaha, a sprawling city of 435,000 people with 4,800 miles of road and not enough tax revenue to maintain them. Decades ago, a number of developers sought permission to lay down asphalt roads rather than longer-lasting concrete in several sections in the middle of town, and to skip installing curbs and gutters preferred by the city. The city agreed, with the understanding that homeowners be responsible for occasional repaving. Some substandard roads also were in areas once outside the city but that were later annexed. For years, the arrangement held up. But as the roads began to age and crumble, and as new residents replaced the original homeowners, resentment intensified about a city government that maintained some neighborhoods while ignoring others. A series of meeting between city officials and residents of the affected neighborhoods, which include about 10,000 houses, hasn’t resolved the problem. “This is insanity,” declared City Council member Chris Jerram at one heated council session earlier this year. Austin Rowser, Omaha streets superintendent, said the city’s position is “a matter of fairness. Some property owners paid for better streets and a minority didn’t.” He added that the city simply can’t afford the roughly $300 million bill to fix all the substandard streets. That doesn’t fly with residents who say that dirt roads or crumbling pavement are unworthy of a well-off community with a growing population, a tiny unemployment rate and four Fortune 500 companies. “Well, gee whiz, if I’m going to be on a gravel street, I don’t think they should increase my taxes,” said resident Terry Hexum, referring to a recent tax assessment hike that would generate revenue for the entire city. He helped organize a protest meeting attended by 200 people about the street dispute. Officials have suggested that neighbors create a district to finance repaving, or the more expensive option of rebuilding the streets to city standards, which the city would then maintain. But when no agreement was reached, city officials dispatched its bulldozers, saying dirt roads were better than deteriorating asphalt. It was not the solution residents were hoping for. Signs went up denouncing Mayor Jean Stothert and other city officials, and one businessman filed a lawsuit that sought to force the city to repave the road in front of his $1.8 million home. Last month, Stothert announced the city would stop the dirt road conversions, would try to set aside more money for repairs and offered to pay half the cost of repaving three stretches of roads that had prompted some of the heated complaints. It was enough to get businessman Bruce Simon to drop his lawsuit, but no one has come up with a funding plan that would fix all the rough road. According to urban planners, the dispute is a case study in how short-term deals that cities make about seemingly minor issues can backfire when the cities and circumstances change. Dan Piatkowski, an assistant professor of regional planning at the University of Nebraska, said the dispute is also forcing residents to think about what they get from government. This is especially useful, he said, in a conservative state like Nebraska that is skeptical of government spending. Many conservatives believe “smaller government is better, but we still want our roads to function,” he said.